Every year, the Kingdom of Thailand has been continuously attracting millions of international tourists from all across the globe, making the Thai tourist visa a high demand in many countries. Thai tourist visa is issued to those who wish to enter Thailand for tourism purposes. This type of visa can be valid for either 3 or 6 months and visa holders are permitted to stay in the country, upon arrival, a period of not exceeding 60 days. Furthermore, those who wish to extend their stay may file for an application for a 30-day extension at any immigration offices in Thailand. Visa extension fee is priced at THB1,900. Note that consular officers may request for additional documents as deemed necessary. We advise that you contact the nearest Thai Embassy or Consulate on this matter. And finally, make sure that you check which option is more applicable for your travel before plunging in with your application. Other alternatives that might be available for you may include visa exemption or visa on arrival to Thailand. Talk to us today if you want to know more about your options. My boyfriend and I have 60 day tourist visas which expire on 30th December. However, we would like to stay in Thailand until 5th January due to our friends visiting for christmas and new year. Is there an option to extend our visas by a shorter period than 30 days? Or would we have to extend by 30 days at the cost of 1,900 baht? Also we are on Koh Lanta at the moment so would the closest immigration office be Krabi town? Whether it is 7 days or 30 days the fee is still 1900 baht per person. You can do the extension at the local immigration office in Krabi town. I want to extend my on arrival visa TR 15 for 60 days but they have stamped immigration only for 15 days. How can I do it? You cannot extend a visa on arrival inside Thailand. You Must apply for the 60-day tourist visa at the Thai embassy in your country. Hi, I entered Thailand on a 30 day visa which i extended in Koh Samui for 30 days. I then went to Malaysia for a few days and returned to Thailand on another 30 day visa. I was hoping to extend further. Can I get another 30 days in Koh Samui or do I have to now get a 60 day visa outside of Thailand? I have an Irish passport. Thank you. Yes, you are able to do 1 extension for 30 days and the fee is the same, it is 1900 baht and you submit 1 passport photo. I am on a Chinese passport with a 15 day tourist visa. Am I able to extend my tourist visa? And for how many days? No, you cannot extend the visa on arrival stamp. I need to extend my visa though I need 3 more days. That means I need to buy the 60 days extension for 1,900 bath, right? Am I not able to do this application at the immigration Office in Chiang Mai or Koh Samui? You can file for the extension at the Thai immigration office in Chiang Mai or Koh Samui as long as you do it before the expiry of the permit to stay. The fee is 1900 baht and you will submit 1 passport photo. What are the documents needed to apply for extension of visa? That depends on what type of visa do you wish to extend. Please call the immigration contact center 1111 for more information. 1) will I be fined when I try again to extend my visa? 2) Do I need a flight confirmation (or any other type of documents) to extend from 60 to 90 days? You need to contact the lady who spoke to you. If you would ask for our advice, you will be overstay already and you cannot file for any extension. You must leave Thailand and pay for overstay fine at the airport. Hello, my visa expires on 21 December and I would like to extend it for 30 more days. Can I do it on the immigration office near fisherman village at Koh Samui? The 20,000 baht finance has to be shown in money or we can just show a comparative in euros? Thank you. You are able to extend this 30-day visa exemption stamp for another 30 days at the local immigration office. For the extension, you just have to submit one passport size photo (4cm x 6cm) with white background and pay the fee of 1,900 Thai baht. Can I extend visa on arrival? Just for a day, how much would it be? Visa on arrival cannot be extended. If you need to extend due to medical reason, please contact the immigration call center at 1111. Im from Chile and I need to extend my visa for a few days because my limit is 13 December and my flight to Europe is on 18th of December. Is it possible to extend? You may contact the local immigration office for a 1 week extension It costs 1900 baht. Copyright © 2013-2016 Thai Immigration - Thailand Visa and Immigration. All Rights Reserved. 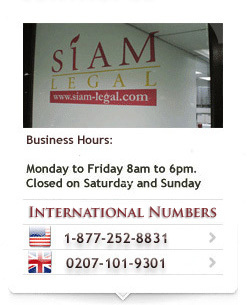 THIS IS NOT THE OFFICIAL WEBSITE OF THE THAI IMMIGRATION NOR CONNECTED TO ANY GOVERNMENT AGENCIES.